The formation and characteristics of a nation’s middle class are shaped by historical context and the developmental path that has been followed. However, can the same be said of the ethnic Chinese middle classes in Taiwan, China, Hong Kong, and Macao? Given the divergent political and economic experiences under which the respective middle classes were created, established, shaped, and reshaped, can they still be characterized as a homogenous group of ‘Chinese middle classes’, or are they more unique within each country? 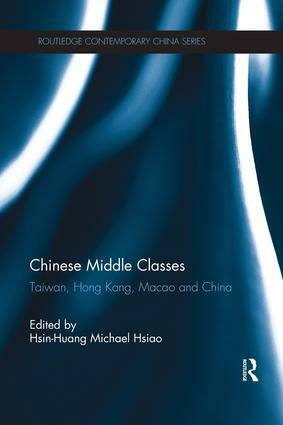 Using systematic survey data analysis and case studies to examine and compare the emerging middle classes in Taiwan, Hong Kong, Macao and Urban China, this book explores whether the middle classes in these countries possess any uniquely ‘Chinese’ features, or if these are shared attributes that can be found in other non-Chinese middle classes in the Asia-Pacific region. It analyses the formation, profile, culture, lifestyles, mobility, and politics of the middle class groups in each country, and highlights the differences and similarities that emerge, and focuses in particular on increased mobility, financial resilience, class anxiety, and political interest and effectiveness. This book will be of great interest to students and scholars interested in Asian middle classes, Chinese studies, Chinese societies, Chinese ethnicity and Chinese politics. The emergence of middle classes in today’s urban China: will they contribute to democratization in China?